Even in the “easy” part of the schedule, there are going to be some games that you probably shouldn’t win. When your starting pitcher gives up 6 runs in 5 innings, you probably won’t — nor shouldn’t — win. The Marlins pretty much had Brandon McCarthy figured out. He gave up 11 hits, including two home runs, in 5 innings, and the Braves offense couldn’t keep up. Ozzie Albies hit yet another home run, and he’s now currently tied with Bryce Harper for the league lead. An encouraging thing tonight, though, is Jesse Biddle’s two inning scoreless performance. He had a rough outing against San Francisco last week (who didn’t? ), but 6 of his 7 outings have been scoreless, and he may very well be here to say. I’ve got all three recaps this weekend, so I’ll be taking you through the minor leagues stop-by-stop. Tonight I’d like to talk to you about the Gwinnett Stripers, and what’s going on with our AAA talent. With Acuna and Soroka now in Atlanta, the prized possessions of AAA are Kolby Allard and the recently-promoted Austin Riley. Allard is six starts in, and he looks like the next prospect up: 34 IP, 2.12 ERA, 1.24 WHIP, 24 K, 12 BB. The walk and K rates need some work, but it’s hard to argue with the results. He could end up in the pen, but he certainly seems to be in position to challenge for an Atlanta rotation spot at some point. Riley has only spent 4 games (as of this writing) at Gwinnett. He’s 5/16 with only one extra base hit, a double. As exciting as he has seemed, one would think he’s at least a half season from Atlanta, if not more. His .333/.394/.677 line in 99 ABs at AA with improved comments about his defense didn’t hurt his chances at being seen as Atlanta’s future third baseman. Rio Ruiz has had a slow start, hitting .248/.304/.344, but perhaps more importantly, he’s primarily playing first base, a position he’s almost certain not to man at the big league level. But his move from being the full-time third baseman most likely means he’s falling fast from the team’s plans. Dustin Peterson has a .825 OPS in 90 ABs, and there’s an interesting amount of AAA depth. Hopefully Peter Bourjos, Chris Stewart, Danny Santana, and Ezequiel Carrera don’t have to spend significant time on the big league roster, but you could do a lot worse, and we have. Thank you, Rob. Game stunk; recap did not. Thanks for the minor league updates! Re: last thread- Soroka should be untouchable. At one point does the old school side of Snit refuse to hit his third-most powerful hitter lead-off? Would think that if Ender gets rolling against both righties and lefties, the lineup can shift down even farther. It’s hard to think that Ozzie Albies is one of the premier power hitters in all of baseball. @3 I’d think Allard, Soroka, and Wright are untouchable amongst the pitching ranks, and that’s the entire list. On the position player side, Albies, Acuna, and Freeman, and that’s literally it for the entire organization. I can’t imagine I’m missing anyone. A lot of the draft mocks seem to like Atlanta taking a college pitcher. Ryan Rolison, LHP from Ole Miss; Shane McClanahan, LHP, South Florida. Baseball America has us on Jarred Kelenic, HS OF. Sadly, just about everyone would love to grab Joey Bart, GA Tech’s catcher, who is a monster, but there’s no way he makes it to us. Ironic that the Giants appear set to take the last two transcendent college catchers (Posey and Bart). @4 Rob, I mentioned on the last thread that Acuna seems to be slumping. In the last seven games he’s lost 110 points of average and over 300 points of OPS with 8Ks. We probably need to be thinking about going back to Inciarte/Albies/Freeman/Markakis/Acuna until he can turn it around again. And note that Acuna’s slump corresponds to the Braves’ mediocrity (3-4 in those seven games). We can’t expect for him to be the best player on the team all the time yet – he spoiled us with his debut. Albies is the best all around hitter/player on the team right now and belongs in the prime lineup spot (2nd). In case, no one’s looked, in the last 28 days Ender has hit at exactly his career averages (e.g. .343 OBP). That is better than either Albies or Acuna. And if you thought Ender didn’t like to take walks, check out First-Pitch Ozzie. Ender belongs at the top of the lineup right now. Ozzie has had some epic battles with pitchers but only if he doesn’t put the first pitch into play (very similar to how First-Pitch Freddie used to be). But neither Ozzie nor Freddie strikeout much and so they make a good 2-3 punch in the order. We have a very aggressive lineup with respect to first-pitch ambushes. There’s nothing at all wrong with that, but we will definitely see some stretches where they are chasing sub-par first pitches and slumping a bit. Acuna has a very good eye and pitch recognition, he just wants to mash it so badly that it’s hard for him to lay off a first pitch strike. Opponents will be feeding him first pitch stuff off the plate and he just has to adjust. I’m fine with him being ready to pounce on the first good thing he sees. Freeman does it. Most good hitters do it. The league will just simply adjust to the ambushes. And then we’ll have to adjust and take more pitches. I’d imagine it’s hard to sneak past the league that Albies turned around Thor’s 98 on the first pitch of the game because Thor was just putting out a get-me-over. Where do people get the idea that Allard is untouchable? If anything, I think he won’t be traded because he’s lost so much luster that the Braves are probably better off hoping his velo returns than they are including him as the second- or third-best prospect in a big deal. I would imagine Allard has reached a point in his development where he’s in that bubble where he’s excelling in the high minors but hasn’t struggled at the big league level. I imagine that’s a difficult point for a FO to trade a pitcher. You’re one step from the majors, and then you could easily be what the FO may be looking to acquire by trading you anyway. That’s a player you probably don’t want to trade. On the flip side, of course, that may be one of the most valuable assets you can trade. I would imagine Allard has reached a point in his development where he’s in that bubble where he’s excelling in the high minors but hasn’t struggled at the big league level. This would be the definition of selling high, if we didn’t already know that he lost velocity. He’s a crafty lefty at best. He’s exactly who you trade for a starter that gives you more certainty of success. If Allard pans out, great, both teams win. It’s not hard. Of the 6 I mentioned, yes, Allard would be the most tradeable. With that said, I think I trust AA to trade just about anyone if it meant putting us over the hump. Perhaps the better way of saying is that Allard would be the 6th-most painful person to trade. Does that work better? I imagine we’ll find out soon enough really how small that list is. Put it to you this way: AA isn’t saying publicly that Allard is a phone call away from the majors because he wants Braves fans to know it. Put it to you this way: AA isn’t saying publicly that Allard is a phone call away from the majors because he doesn’t want Allard to think that he’s not one phone call away from the majors. Anyway, he could absolutely be publicly posturing, which is great and very likely, but you’re not going to convince me that AA isn’t exhibiting a lot of behaviors that tell me that he’s willing to throw the pitching prospects in there in hopes of making this a contending year. So the answer is probably both, but don’t tell me he wouldn’t be willing to give Allard innings this year. 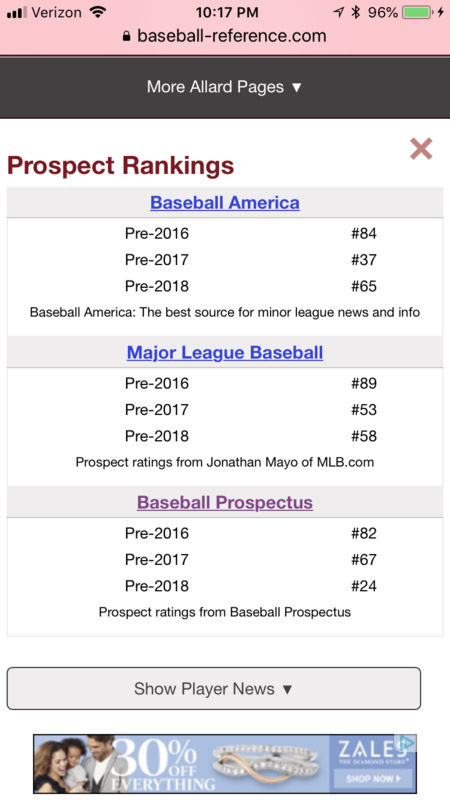 This is why there are complaints about prospect-hoarding being taken too far on here. Allard may have enough of a set of qualities that makes him good. Trade him and other prospects for a pitcher who is good. It’s time. I would predict that Joey Bats is about 2-3 more 0-fers away from a platoon. And if he can’t hit lefties, then he’s about useless. I really don’t see the issue of using 50 or so sub-replacement level ABs to determine that he’s just not there. I can’t imagine we’re going to be missing much by cutting bait that early. DOB said Dansby will be out more than 10 days, so that puts us at least through the 14th, so Bautista could hang out for around a week as a lefty platoon and then they can make a decision between him and Culberson to make room for Dansby. It is NOT time to sell any top prospects. No way. This team is not close enough to playoff contention that one piece will make a difference yet. Also, this team has prepared very hard to make a concerted push for contention next. That’s when money will be available to bring in a top FA. Once we have whatever top FA we intend to buy THEN we can think about using prospect trades to make the team better. I am absolutely in favor of rental trades or some sort of deadline trades using lesser prospects to fill gaps/holes in the current team. The Braves have already used this tactic mostly to improve the farm, but it’s time to do it to improve the big league team. Povse, Gant, Whalen, Mallex, Yepez, etc… were all in the top 30 at some point- mostly in the 20-30 range. We got at least a couple of top 15 prospects (Gohara, Jackson) and Jaime Garcia and Matt Adams for those efforts, which I consider a big success. Both Adams and Garcia were really great rental type trades. We could use another Adams type that can actually play 3B and Bautista ain’t it. BTW, I don’t believe the whole “Allard is trending down thing; sell him now”. Whatever you think, he’s still very young at 20 and still has a lot of room left to build arm and body strength. If had counting stats Rex Brothers, I might think different but he is the ace down in Gwinnett and is looking better than Wright so far. It’s a good thing Brian Anderson is not Aaron Judge. The Braves would be down 3-1. Soroka hasn’t quite got it going yet. 3-0 Ks to walks but single, single, double is not good – with two outs no less. I wonder how low Acuna’s average is going to need to go before they move him down in the order – currently at .266 and dropping. Soroka has settled down nicely. 5K’s, no walks. Love it. Bowman has indicated that it’s already a platoon at third between Flaherty and Bautista. Ok. I thought he had a bit more string. But since there’s a lefty today, I guess that’s why he’s starting. Kakes already has more WAR this year than any year past. If he can be just replacement level here on out, he’s good for a career high. I hope Soroka can keep it up for a couple more innings. He’s got a little more breathing room now. He seems to be getting stronger. All of this with two outs. And Bautista is going to cost us the game. Drop the turd and flush. Soroka doesn’t deserve this. It’s all Joey Bautista. That’s probably it for Senõr Bats. I swear Bautista has given up all the runs tonight. AA’s love affair with Bautista has now come to a crossroads. Fortunately for Soroka, none of these runs are earned. I have to say trying to make Bautista a 3b was not one of AA’s better ideas. Soroka could not get the third out in any inning – all damage done with two outs. Not a single 1-2-3 inning. I really hope he hangs them up after today. Soroka’s Adam’s Apple is as big as his head. Could anybody get an easy third out with dipshit at 3B? Anyone think Flaherty might be better? At least Culberson fields his position. Soroka has a .408 BABIP against him. And Bats tries to make up for it. Baseball, what a game! @45 I was just wondering what his BABIP against was, seems like both the last two games it’s been all dinks and dunks ….. and errors. 4 runs scored after his error, so that didn’t quite make up for it, but it’s a start. He would need to score another 4 runs to break even. @49 He can’t make up for 4 unearned runs with no one on base. We need Flaherty and Dansby back in the lineup for both offense AND defense. I can’t see the game. What’s the deal with Camargo and infield singles? It was a grounder up the middle that he barely got to and stuck it in his pocket. It is NOT time to sell any top prospects. No way. This team is not close enough to playoff contention that one piece will make a difference yet. Who said anything about trading for a player for this season? I am absolutely in favor of rental trades or some sort of deadline trades using lesser prospects to fill gaps/holes in the current team. The Braves have already used this tactic mostly to improve the farm, but it’s time to do it to improve the big league team. Once we have whatever top FA we intend to buy THEN we can think about using prospect trades to make the team better. How about the team takes whatever opportunities that present itself whenever they present themselves to make this window of contention more certain? Is that at all controversial? BTW, I don’t believe the whole “Allard is trending down thing; sell him now”. It’s been a long time now since he threw remotely hard. It doesn’t bode well for him as a starter. He’s fallen off every prospect list for a reason. In a sense it’s too late to truly sell high. No trades are going to happen now anyway. But this conversation was originally about whether or not Allard is untouchable. He’s not. The one last inning was a grounder in the hole that nobody but Andrelton throws out. Get back in the dugout, Donnie Baseball. @57 Baloney. Allard is still the Braves 6th best prospect and the Major League’s 7th best LH pitching prospect and whatever decline you see is sure not reflected in his performance. I still see him as untouchable. He’s 20 years old for freaking sake and already at AAA pitching brilliantly. Flaherty is already paying dividends in the field. Trades are like bear attacks, and Dwight Schrute will tell you that they happen when you least expect them. Shane Carle. What did we do to deserve to receive this relief ace? I haven’t heard any reports on how hard Allard is throwing this year. Not sure if this is paywall, but Kolby’s new changeup is fuego. So basically a similar arsenal to Newcomb, but less velocity and more command. Jesus. He has thrown 34 innings this year. In that meaningless sample his K/9 is 6 and his xFIP is over 4. I just want to gauge the level of crazy I’m dealing with here… let’s say the Indians wanted to trade us Corey Kluber for Allard. Would you say, “No, Allard is untouchable”? Exactly. Big looping curve, deceptive changeup, but no big fastball. Beating Newk’s historically hasn’t been difficult. Allard and Newcomb backing up in the rotation could be interesting in a 3-game series. Similar but very different. @67 That’s a stupid question. The answer is obviously no. But Allard-as-headliner-for-Marcell-Ozuna probably doesn’t work. It is a stupid question, but I want to hear Roger’s answer. I agree with Rob is the answer. so, Adam R, would you trade Freddie Freeman for Mike Trout straight up? Stupid questions don’t deserve intelligent answers. No one is untouchable if Mike Trout is available. Among normal people, Mike Trout and Freddie Freeman and Kolby Allard are untouchable. Among normal people, Mike Trout and Freddie Freeman and Kolby Allard are untouchable. This is quite a sentence. How about someone mentioned here the other day? Jon Gray for Kolby Allard. Yes or no? A soft tossing lefty that weighs 165 lbs is not untouchable. Lord. The Lemmer just sounds drunk. @73 I wouldn’t even let them finish talking before I said yes. Dude has a FIP in the mid 3s pitching in Colorado and 9.5 K/9. The Braves would be INSANE not to take that trade. I said Gray. That’s a good one. I think Gray is under control for a couple more years. I’d say I’d probably trade Allard, but it’s close, and that probably tells us where Allard is. 75 — It’s like they gave him a job because they are trying to take care of him knowing he can’t do anything else. I don’t know anything about the guy outside of baseball, but he is not good at talking. I don’t say this often, but I could do a better job than Lemmer. I could not do a better job than Frenchy. He’s better than Sutton. Yes, I know what I’m saying. The worst prospects on this list are ranked a 50. It seems like Allard just missed this list. Irregular verbs mess him up. His status within the Braves’ system says more about the system than this. He took a dive because the velo drop. He’ll get a bump with the improved repertoire. Listen, if they trade him, there’s no tears shed. But he’s probably not a player you’d want to trade based on where he is right now. His poor K rate and AAA performance is akin to Newcomb’s poor BB rate and AAA performance last year. You didn’t want to trade either player. Other publications like Allard a lot more. That being said, I would definitely pull the trigger on a good return. Freeman is absolutely on fire right now. @78 When trying to answer stupid questions, it’s not always true that an intelligent answer even makes sense. The bigger question is would Colorado accept such a deal? I don’t think they’d trade, straight up, a passable major league pitcher for a propsect, no matter how good, who has no major league experience in the middle of a season when you have playoff aspirations. Whether I or, you, Rob, would agree to such a thing is moot because the Rockies wouldn’t agree to it. I’ll wait for a stupid question from Adam R that actually has some potential merit to it before I give a real answer. As I mentioned, under normal circumstances where one is living in the real world, Kolby Allard is untouchable at this stage of his career and of the Braves’ development. If some other major league team is living in the same fantasy world as Adam R then maybe one might agree to trade Allard (or Trout or Freeman or Kluber or Gray). Honestly, the Braves haven’t given up on Braxton Davidson and Jason Hursh, why should they even consider trading someone like Allard? When was the last time the Braves were willing to trade any #1 draft choice before they hit the majors? I guess the Salty trade sort of counts and that was 11 years ago although he had been in the majors for a cup. Chip: Look at Freddie run!!! Three seconds later he was thrown out by 10 feet. His poor K rate and AAA performance is akin to Newcomb’s poor BB rate and AAA performance last year. I’m not sure these things can be equated. It’s more likely that Newcomb’s command improves over time than Allard gains velocity. That’s a game that last year the Braves would have lost 90% of the time. You gotta win a good many games like this. The point of setting up these unrealistic hypotheticals is to determine what you mean when you say “untouchable.” The word should mean “not for sale under any circumstances.” Freddie was apparently untouchable during our rebuild. Carlos Correa and Kris Bryant produce so much value for so little money that you couldn’t do better than them in a trade if you tried. When Roger says “untouchable,” he seems to mean “I really value this player, but if the right circumstances come up, I’d consider a trade,” which is not actually what “untouchable” means. Saying Kolby Allard may have a future as a major leaguer isn’t a provocative statement, nor is saying you’d trade him if the right deal came along, but saying he’s untouchable is. It doesn’t matter if the scenario is unrealistic — if the Rockies lost their minds or if Nolan Arenado and Charlie Blackmon both mysteriously vanished off the face of the earth tomorrow and they decided to rebuild and offered us Jon Gray for Allard, would you do that deal? Chief @77 is exactly right. There’s no harm in saying it. @83 Nope. Fangraphs has Allard as a 50. And I’ve been referring to the MLB Pipeline list. Apparently, opinions vary. Untouchable means is there a trade both sides would agree to one-for-one that would include this player. I don’t think there is. Your unrealistic scenarios have no discussion value because they are …… unrealistic. Within 2 standard deviations, there is no trade out there that would likely be acceptable for the Braves to include any one of their 15 prospects from MLB Pipeline or top 17-20 from Fangraphs top 32. At this point in time, those are untouchables in a realistic sense. Given an unrealistic scenario, I can’t say because I’d trade just about anyone for Trout in fact multiple anyones. Jon Gray, probably not. He has not shown top of rotation capability. Fullmer is OK but seems kind of fragile. Archer is being terrible right now. Looked awful against the Orioles today. Danny Duffy is pitching like crap. Dylan Bundy looked good earlier this year but Allard wouldn’t be enough to get him. Blake Snell would be a good target but chances are near zero the Rays would give him up. I really don’t see a decent trade target for Allard right now. Basically, Fangraphs has Fried, Wentz, and Allard the same and I’d keep them all. Not to mention that Allard is “next man up”. Unless, Gohara or Fried suddenly find their mojo, once McCarthy goes down for the count, Allard will be the next one into the rotation. No way, the Braves trade him at this point. @24 Markakis’s best season is like 7 bWAR and 6 fWAR. He has a long way to go to set career highs. @83 I’d say the Jesus Lizard is pretty untouchable. The Jesus Lizard is coming to Washington, DC this fall, and I’m incredibly excited. Goat is a near-GOAT of albums. Great win last night. Freddie is on fire and taking over with Ozzie and Acuna taking a break. We have a deep offense. Who would have thought? So many weak singles against Soroka last week and last night. Untouchable means is there a trade both sides would agree to one-for-one that would include this player. I don’t think there is. When everybody else on the planet uses the word “untouchable” with regards to baseball, they mean to say that when GMs or their staff communicate with each other about potential trades, there are some players who are explicitly excluded from that discussion for whatever reason. Your definition of “untouchable” includes literally every prospect in baseball right now. Not just the one we’re talking about, who we both acknowledge happens to be ranked merely as a 50. Every single prospect a GM can’t manage to trade in a one-for-one (because why not add more absurdity to this definition…) deal, you’re saying, becomes untouchable. I thought you’d either be way overvaluing Allard or you’d simply be using the word wrong, but you managed to do both! I tip my cap. Not to mention that Allard is “next man up”. Unless Gohara or Fried suddenly find their mojo, once McCarthy goes down for the count, Allard will be the next one into the rotation. No way the Braves trade him at this point. Just 80 posts ago, you were insisting that this team isn’t close to playoff contention this season. If that’s true — and it is becoming gradually less true by the day — then why should it matter who the “next man up” is? I didn’t click the link @65 until now. I can’t say I find it very convincing. For one, the Braves farm director talking up a prospect in vague terms isn’t much different than the GM doing so. And the article says that the improvement in Allard’s changeup happened over the course of last season in Mississippi. This isn’t a recent development. So, this pitch was supposedly improving his stock as he was falling down prospect lists? What we have this year is a small sample where the meaningful results (aka not ERA) aren’t actually better. Maybe the truth will out with a larger sample. It’s the minors, so maybe he’s focusing on improving other pitches and not worrying about strikeouts — or, for that matter, his command, because if that’s going to be his blue-chip-prospect calling card, I’d want to see him do better than a 3 BB/9. Maybe someone who’s not a part of the Braves organization will say something at some point to back Trembley up. Until those things happen, I’m skeptical. Allard is somewhere between “would really prefer not to trade” and “untouchable”. Can we agree on this? No, Allard has been the number one trade candidate for us for over a year. But here’s the thing, a risky pitching prospect just isn’t going to give us back all that much. Everyone overvalues their prospects. That’s why any meaningful deal is going to involve multiple good prospects, and Braves fans are going to go nuts on the interwebz when it finally happens. @106 No. Here I thought Julio was the #1 trade candidate for a couple of years. And I certainly think Kemp and Markakis (and Garcia) were bigger trade candidates during that time. As far as prospects go, I think the ones we actually traded have been bigger trade candidates. Allard has drifted between untouchable and some wacky people thinking he might be touchable. @104@100 When you set up unrealistic scenarios, no one is untouchable so I think your definition is just as wrong as mine. You don’t seem to understand the concept. You can’t define our untouchables without the context of knowing who they might be traded for. Once you have a sense for other teams’ untouchables then you can define ours. Would you trade Acuna for Trout straight up? Or Albies? I hope so. Except that Trout is not available and neither is Acuna or Albies. No one is untouchable in any sport or league unless someone else is too. I define Allard as untouchable because I don’t think there is a realistic trade that another organization can come up with that would pry him out of my hands. And that does not apply to all of the Braves prospects as I have repeatedly said. I propose trading this year from the lower level prospects for good rentals and thinking about trading from the higher level prospects next year. At this point, as I said, I think that more or less the top 15 or so prospects are untouchable this year. As to your accusation, Adam R, that I said the Braves are not a playoff team this year; that is 100% incorrect. I said they are not yet a championship team caliber this year (with a YET) thrown in there. As our survey is showing above, I, along with a plurality of others believe this is a borderline playoff team. With respect to the uncertainty of this year and having so many inexperienced players, I believe we should not dive in and trade the whole farm away. We should try and incrementally improve the team this year and take the big leap over the winter. This is the obvious pretty much publicly stated plan the FO has been working toward. There’s some nuance to it (i.e. should we try out Riley before the trade deadline or not? Snitker thinks so), but overall the plan I just laid out is being executed. I also laid out the best trade possibility now a couple of times and I also think it is what the Braves are working toward by testing Riley and seeing how ready he is. Can Riley be our deadline addition or should it be Moustakas or Beltre? Bautista is a stalling tactic and a prayer. Flaherty and Camargo are fingers crossed that they don’t go bust. We won’t know if the Braves FO is ready to win this year until closer to the trade deadline. Riley will be in the majors for a test run sometime between mid-June and the ASB.